Traumatic Brain Injuries (TBIs) are among the leading causes of death and disability in the United States. Statistics from the Centers for Disease Control and Prevention indicate that approximately 1.7 million people each year fall victim to TBIs. Additionally, TBIs account for a full one third of injury-related deaths in the country. The causes of a traumatic brain injury may vary. Regardless of the circumstance, victims and their families often face serious difficulties following these injuries. They may experience debilitating long-term consequences, or incur substantial medical bills. If you or a loved one has suffered a TBI in the Philadelphia area, get in touch with a Pennsylvania brain injury law firm to find out if you may be entitled to compensation. Our Philadelphia traumatic brain injury lawyers at The Rothenberg Law Firm LLP have spent decades pursuing justice for people like you. Thanks to our experience, we thoroughly understand how to win TBI cases. On top of that, our Pennsylvania brain injury attorneys know that victims and their families often struggle emotionally in these circumstances. Through a compassionate approach combined with decades of experience, we help relieve some of the burden. Car accidents are among the top causes of TBIs in the U.S. There are several ways the brain can sustain injury during an automotive collision. In some cases, the victim’s head strikes another object at high speed, like a windshield or dashboard. Even if their head does not strike another object, the sudden acceleration/deceleration motion of whiplash can also cause long-term harm. Some TBIs don’t even develop until after the accident. These injuries are often the result of damage sustained to the brain tissue. However, brain tissue can begin to swell and/or bleed after the accident which caused the TBI has already occurred. 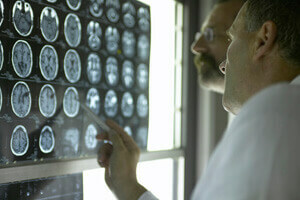 The consequences of traumatic brain injuries may be significant. Victims often suffer temporary or even permanent brain function impairment. It’s not uncommon for victims to experience some degree of long-term debilitation. Additionally, “anoxic brain injuries” can deprive the brain of much-needed oxygen. The consequences of such injuries may be life-threatening. According to the National Center for Injury Prevention and Control, the groups most likely to suffer from TBIs include children under the age of 4, adolescents between the ages of 15 and 19, and the elderly. If you or a loved one has suffered a TBI in the Philadelphia area, you may be entitled to compensation. That said, TBI cases are often complicated. You need professionals on your side who are equipped with both legal and medical expertise. That’s why you need to contact The Rothenberg Law Firm. We have more than 48 years of experience helping clients like you secure millions of dollars in compensation. Our Philadelphia traumatic brain injury lawyers leverage every necessary resource when pursuing justice. That involves working with medical professionals who can assess your injury and determine the link between the injury and the factors that caused it, and provide expert testimony during trial. We also coordinate with forensic economists to assess current and past losses and project future losses. To discuss your case with a Philadelphia brain injury attorney, call us today at 1-800-624-8888 or submit a free online case evaluation. Your initial consultation with a brain injury lawyer in Pennsylvania is free of charge. If we take on your case, we work on a contingency fee basis. We won’t charge any legal fees unless we get you compensation first. It’s important to understand that the Statute of Limitations establishes deadlines for filing a lawsuit. Get in touch with our team of Philadelphia traumatic brain injury lawyers today to avoid forfeiting your right to compensation.